Reprise (2018) is a computer-generated animation project centering on subjects such as childhood trauma, the school system, peer pressure, and teenage melancholy. 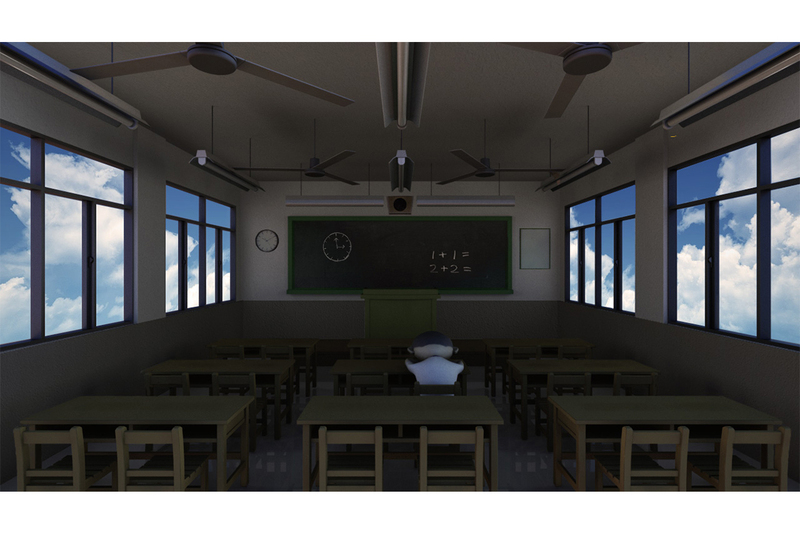 In this work-in-progress, alternative reality blends with surreal dreams, the protagonist, a schoolboy alienated and isolated from his peers, sleeps alone at his desk in a dark classroom while the windows display a vivid blue sky, and practices basketball endlessly in an empty playground under harsh weather conditions. This new work in progress, which was developed by Taiwanese artist Poyen Wang while at 18th Street Arts Center, will be presented in a screening during a reception on Wednesday, December 12, from 6-8 pm. For free tickets, RSVP here. Image caption: Poyen Wang, Reprise, 2018, dimension variable, multi-channel 3D animation installation, two screens. Courtesy of the artist. Poyen Wang is a New York-based artist from Taiwan. His art practice primarily takes the form of video and installation, creating immersive environments to provoke viewers’ emotions and imaginations. His work usually derives from personal experience and then evolves into research of the people or places he is associated with in order to explore their collective history and memory. Using digital media, especially moving images and 3D animation as primary medium, he is concerned about how complex and intricate our identities are under the influence of digital culture and globalization. He examines how we perceive the outside world and our own existence in an age when our bodies are extended by advancing technology and our perceptions of reality are deeply intertwined with the cinematic. Poyen Wang’s residency is supported by the Ministry of Culture, Taiwan, and the Taiwan Academy Los Angeles, and the Trust for Mutual Understanding (TMU).